The college degree is considered the best ticket to a rewarding career and the middle class. But many say the traditional degree pathway is failing to meet the nation’s postsecondary education and training needs. As a result, a growing number of colleges are partnering with employers -- or brokers who make those connections -- and noncollege education providers to offer alternative credential pathways. Paul: We're seeing some interesting experiments with project based learning. One of the most interesting ones I found was a company called Parker Dewey which does Micro-Internships. The founder was running an internship program and felt like he could do something in this space and created a low risk, basically paid audition for a job. So an employer, lots of employers, will post projects online. Short-term projects. They're 10-80 hours. These are paid. The students apply. They're selected and then they complete these online projects. And you can see why this would work: the companies are getting a work product, they're screening for potential employees. The students are doing something, they're figuring out if it's something they're good at, and they can put it on their LinkedIn profile or their applications going forward. Parker Dewey's had a bunch of colleges sign up in just the last few months. One of them is Purdue University, their College of Liberal Arts is a big backer of this and the dean there told me they like the idea of their students dabbling, using those Liberal Arts Degrees in practical ways to figure out not just what they want to do but what they can do. Doug: One question that I thought Paul and I might both take a shot at is "While the credential may recognize the knowledge skills and abilities gained are there any programs that also include evidence of learning via work products - writing samples, example coding, GitHub projects, etc?" Paul, did you come across many of those in your research? Paul: Yeah, I mean I think there's definitely a broad shift to project based learning and these programs tend to feature that because, frankly, it's a lot of what employees will be doing and I mentioned it already but I highly recommend you check out the website for Parker Dewey. A relatively new company, working with colleges, you can probably partner with them if you'd like. They post project-based learning, online projects, on their site for you to see the sort of things that students are able to do. And again the idea is that if you can do these kind of bite sized skills-based projects, it both helps prepare you better for a job and it helps signal to employers with more clarity what you can do than maybe even a traditional credential. 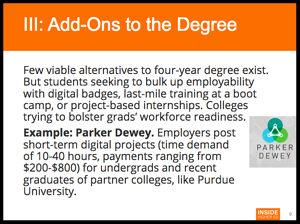 Download an excerpt of the special report, On-Ramps and Off-Ramps: Alternative Credentials and Emerging Pathways Between Education and Work, featuring Parker Dewey below.